When you and your senior loved one make the decision that it's time to move to an assisted living, memory care or independent living community, you want to know that he or she will get the best care available. You also want to be sure the food there is not only tasty but also nutritious and served by caring staff members. The dining facilities at Edgewood communities offer this and so much more. Nothing says home quite like your favorite meals. When your loved ones make the big move to an assisted living community, it's important that you help them feel at home there. Eating their favorite foods can be a huge part of that! When Edgewood communities decide their menus, they look for resident feedback. We spoke with Melanie Metz, R.D., the Corporate Director of Dining Services at Edgewood, to learn about how the five-week menus are planned. Metz mentioned that Edgewood uses Grove Menus, a menu management software that provides dietitian-approved menu programs complete with recipes and ingredient lists, helping make managing dining services a healthy breeze for the community Dining Services departments. "At each Edgewood location residents have unique dietary preferences." Edgewood residents have their own unique food preferences, and the software program allows the dining staff to make adjustments as necessary to fit resident preferences while maintaining a menu that is nutritionally balanced and sound. What will your loved one eat during his or her stay at Edgewood? Twice each year, Edgewood Dining teams help plan a new five week cycle menu; one in the spring/summer and another in the fall/winter. Popular items include beef roasts, fried or breaded chicken, fish tacos, hotdish, a plethora of macaroni options and egg bakes. There are many varieties of salads, like egg and pasta, as well as sandwiches, too. Each community also plans their own unique "special events" calendar, and it is common to see prime rib, steak or walleye dinners in conjunction with these special events. Families are often invited to visit their loved one at Thanksgiving or Christmas for a taste of a delicious turkey, roast beef or ham dinner. Individuals in the memory care programs or who have physical conditions that limit their mobility may receive help with their food to cut it into bite-sized pieces. Dining staff also ensure these residents have special options such as boneless chicken breast instead of bone-in chicken because boneless versions are easier to eat. And of course, there are a lot of different kinds of desserts from delicious fruit and cream pies, brownies, varieties of cookies and ice cream, as well as fresh or canned fruit – it's important to satisfy the residents' sweet tooths! Edgewood communities offer individualization and the least restrictive diets possible for their residents. Metz shared that Edgewood often works with physicians to prescribe a regular diet to residents because the menus are nutritionally balanced. Prescribing restrictive diets can lead to unpalatable or unacceptable foods, and may alter food and fluid intake. "Our residents can make healthy diet decisions off our regular menu," she noted. From grilled chicken salads with low-fat dressing to fruit options, Metz stated it's easy to select both healthy and tasty items right off the regular Edgewood menu. The dining options at Edgewood include plenty of healthy choices as well as tasty desserts. Tyler Zent, the Corporate Chef Specialist at Edgewood, explained the new Chef Specialist program. This new exciting program adds another layer of Dining Services resources for all Edgewood communities. The Corporate Chef position oversees 3 "area chef specialists" throughout the company. Along with Zent, these specialists are available to provide educational resources on such topics as proper weights and measurements, knife skills, handling meats and center of the plate foods. They also offer assistance with garnishing, video trainings, safe food handling courses and on-site hands-on training to enhance skills necessary to be an "Edgewood trained" Dining Services employee. Chef Specialists will also work with the Dining Services Director and Dining Service specialists to follow up on any action plans provided during annual mandatory dining audits to ensure residents receive the best quality food and service possible. Most of our residents are part of the Greatest Generation, and enjoy meat-and-potatoes, both Zent and Metz shared. 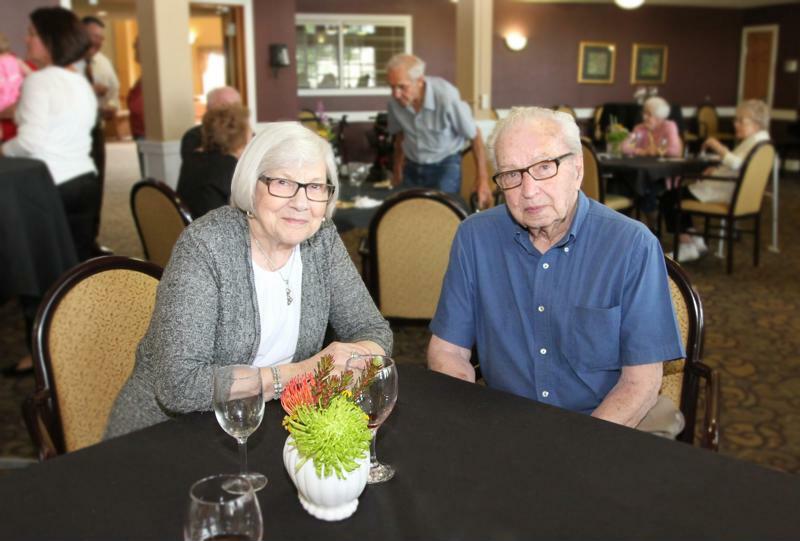 While some of this nostalgic eating has trickled into the younger generations, a major shift will occur when Baby-Boomers and Millennials make their way into assisted living communities. To adapt, Zent and Metz noted there will be some serious changes in Edgewood dining in future years. From offering more flavorful options like ethnic and authentic foods to creating stations where residents can pick their meals, a lot of the dining experience will likely be much different. Communities will also likely offer more options like farm-to-table dining; organic produce; vegan and vegetarian options. Metz noted it's a very exciting time to be in the business of providing Dining Services for our seniors – the possibilities are endless. Metz has enjoyed being part of the development of the Chef Specialist program. With 30 years of varying work as a dietitian, it is exciting to be a part of combining nutrition knowledge with the experience of Edgewood chefs. They add an element of creativity to the dining experience that will help Edgewood communities stay on the cutting edge. Metz mentioned Zent stresses the importance of making sure the menu items are presentable. He'll note to add some parsley, cut the dish differently or add a lemon wedge, and it greatly improves the look, which in turn makes residents more likely to try each dish. Look no further if you're trying to find an assisted living community that offers healthy, delicious food that your senior loved one will enjoy.